Set in the heart of Seville, the Melia Sevilla is conveniently located to to Alcazar, Barrio de Santa Cruz district, the Cathedral and the Archive of the Indies. 365 spacious rooms feature a modern and contemporary style and thoughtful amenities. The hotel also features an outdoor pool with a large sun terrace overlooking Plaza España. 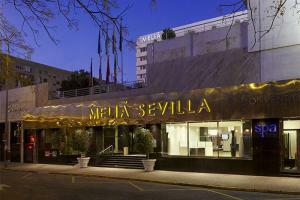 Located in Seville's city center, approximately seven miles from Seville Airport.